The kids have been out of school since last week and are already underfoot. They take after me and are reluctant to head outside when the temperature dips, unlike their stalwart father. Also, I'm a bit under the weather, a fact which is particularly inconvenient since I am a procrastinator and still have unwrapped gifts, un-sent cards (sorry far-flung relatives, look for 'em around New Year's…) and a messy house to deal with. Blargh. The holidays are in full swing already, being the third day of Hanukkah. Roo is incredibly interested in all things Jewish this year, so we've been lighting the menorah and I've been reciting the prayers in Hebrew school dropout mode, much to her delight. I got a bunch of fabulous and timely craft ideas from the Pottery Barn Kids Design Studio via email, yay! Now if they would only send us new bedroom furniture so I could replace Roo's evil green bunkbed of doom…obviously my fever is making me delusional. Here are a couple of their great ideas to help your family share the joy of Hanukkah! 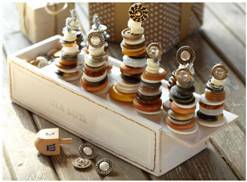 This crafty Menorah is easy to assemble – and best of all, kids can "light" the candles on their own to celebrate each night of Hanukkah. 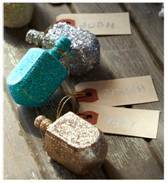 Bring a little sparkle to Hanukkah celebrations with creative Glittery Dreidel Place Cards. They're simple for kids to make and add a fun element of festivity to the table – plus, they make great party favors. Jasper loves to sing "Dreidel, Dreidel" over and over again, even though he only remembers the one line. Heh. Last-minute wrapping to do? Give your presents that extra little flourish of hand-crafted care, and try one of our creative approaches to gift wrapping. Make your presents even more magical this season with Starry Wrap, Keepsake Footprint Paper and Rudolph’s Nose Wrap. My cats would go nuts for that yarn "nose"
For more holiday ideas or for inspiration and advice year-round, visit the Pottery Barn Kids Design Studio. I was not compensated for this post, just thought my readers might like some busywork with attractive results for their kiddos, too.